As October roles on, it’s time for me to review another classic horror movie, and sense my theme this year is horror films from the 1990’s, let’s center our attention on 1999 specifically. This was a monumental year for the genera as several new films were taking horror to new, uncharted heights. “The Blair Witch Project” for example ushered in a new area of reality horror, and fulled the audience into believing that everything viewed on screen was real. "Audition" brought the grizzly torture genera into play, and proved once again that Japan had some scary material. “The Mummy” showcased how awesome horror can be when laced with action/adventure, and proved that a remake can escape the shadow of the original. However, the really big movie of the year, and in my opinion the greatest horror movie of the decade was “The Sixth Sense”. It had six Oscar nominations (funny, it’s like six for six), including best picture, was one of the decade’s highest grossing films, and for the longest time was the most rented movie in America, with over eighty million copies handed out in the year 2000 alone. That’s no small accomplishment for a ghost movie, let alone a film constructed by a “then” unknown director/ screen writer like M. Night Shyamalan. 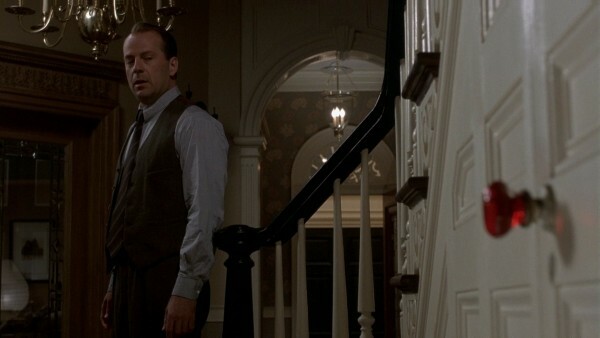 Even after all these years, “The Sixth Sense” holds up masterfully, and is one of my personal favorites for sure. I can’t think of any other horror film that did such a good job scaring me to death while also pulling at my heart strings all the way. 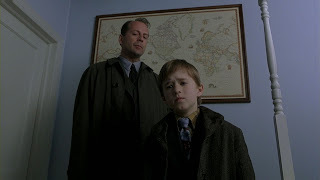 In this unique ghost tale, Bruce Willis plays a child psychologist named Dr. Crowe, who’s beaten down by the failure he had with a previous case, and his marriage is crumbling beneath his feat. Despite all the drama going on in his life, he’s still whiling to offer help to one last case study which comes in the form of a little boy named Cole played by Haley Joel Osment. This little boy is having an equally troubling time right now, he doesn’t get along with anyone, his father ran out on the family, his mother is emotionally grief stricken and worse yet, the boy carries a dark secret that he’s scared to share with anyone. As the doctor and boy form trust exercises, our troubled child is finally ready to reveal his haunting secret, a heightened sixth sense which gives him the troubling ability to see and even speak to the spirits of dead people. 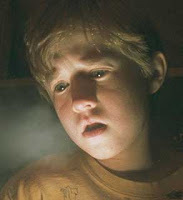 These spirits tend to visit the child often and invade the comforts of his very home, but he doesn’t know why. The doctor wants to do all in his power to help him, and maybe even help himself in some spiritual way. His suggestion to the boy is that he faces his fears, and try communicating to them. It’s discovered that these sprits are all lost souls that had their lives cut too soon, and died without giving any proper closure to certain events. It’s now the boys responsibility to give their lives closure, so their souls can move on. In my last review of “The Silence of the Lambs”, I noted that the 1990’s was an age in which horror movies largely revolved around monsters that happen to be completely human. 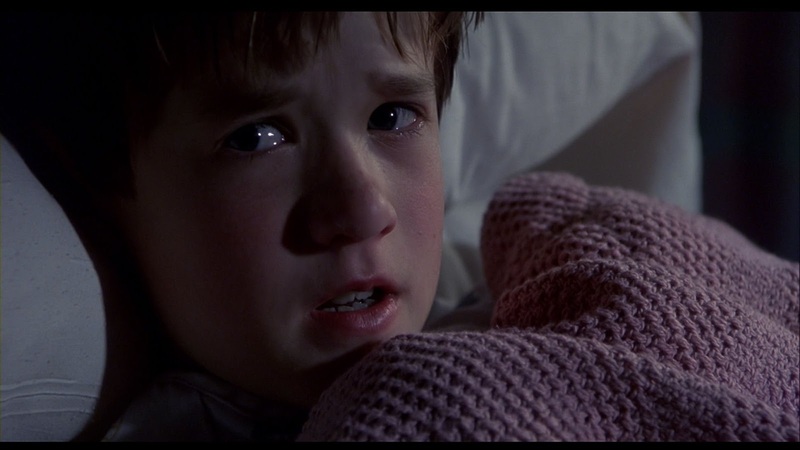 Well, the same thing actually applies here with “The Sixth Sense”. Yes, there are ghosts present, and supernatural events occur, but none of the spirits featured in the movie are evil, nor are they dangerous. The only threats present in the film come solely from human characters and their actions. For example, there’s a subplot revolving around the spirit of a dead girl, who was secretly poisoned, and killed by her wicked mother. This whole section revolving around the little girl was far more disturbing and terrifying then anything supernatural related that I’ve ever seen in a horror film. Just the thought of this horrible woman slowly killing her child without the father knowing is one of the most frightening concepts you can possibly imagine. This for me is what other horror movies lack, and that’s “REAL LIFE HORROR”. Many of the stories and tragedies revolving around these lost souls were all very interesting, and could have had their own spin off films. Some of the scariest moments honestly revolve around our lead boy and his interactions with other human people like his strict teacher, or the school bullies. It’s also hard to describe, but there’s something very beautiful about this premise, and how this boy brings closure to the lives of these spirits. It’s the themes of what makes us human, and finding closure to the things we were never able to do which make the movie so enduring. What’s especially brilliant about this concept is that while the ghosts aren’t evil, they are still terrifying, and every encounter with them leads to some shocking moments. 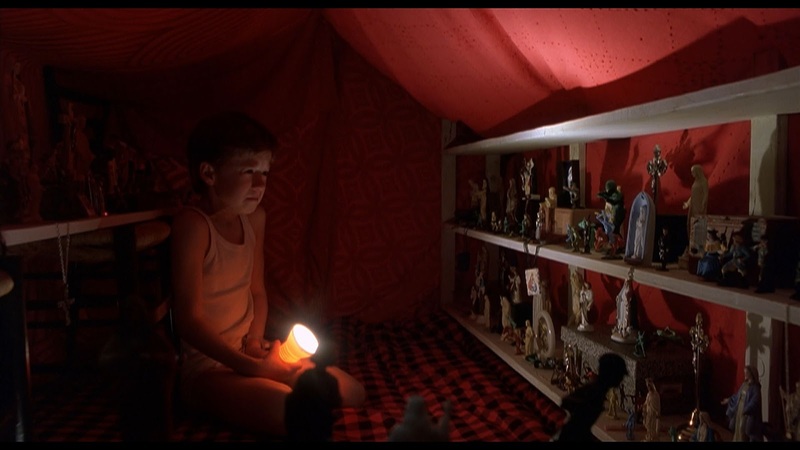 I’ll never forget the scene in which Haley Joel Osment is alone at night in his red tent only to be visited by the spirit of the sick girl ... that scared the piss out of me. Now there are some random haunted house gimmick’s thrown in, which may be a touch out of place but they never go too far. There’s one scene in which the mother exits the kitchen, there’s a tracking shot following her into a different room, and then we see her re-enter the kitchen which has been completely re-arranged in the span of just a phew seconds. It feels like a direct inspiration from the 1982 classic “Poltergeist”, and it works in creating an eerie mood. Much like Stanley Kubrick’s “The Shining”, this film knows how to save its scary content for just the right moments, while also pacing a really good screen play. The movie was also blessed with a very talented cast. Our lead actors Bruce Willis and Haley Joel Osment have excellent chemistry, and the film just wouldn’t have worked without either of them. Bruce Willis was mostly notable for his action roles, and had just come off big hits like “Armageddon” and “12 Monkeys”. So staring in film like this was considered a risky carrier move, but it paid off, and in my opinion, this is his best role. Toni Collette plays the boys troubled mother, and she too is a great talent. Everything she dose feels very natural, and her performance got her an Oscar nomination for best actress in a supporting role. 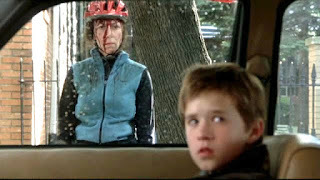 Of course the real talent who completely steals the show is Haley Joel Osment as the lead boy. He really set a template for other young actors to follow. His eerie and vulnerable performance was so strong that he received an Oscar nomination at the age of just twelve, now that’s what you call talent. Director M. Night Shyamalan also disserves a lot of credit, as both his artistic vision and screen play were very inspiring. He also received two Oscar nominations for best writer and best director. Things didn’t stop there as the film was also nominated for best editing and finally it received the coveted best picture nomination, but lost to “American Beauty”, which is ridiculous. I could have respected “The Sixth Sense” losing to “The Green Mile” that year, but to “American Beauty” ... come on. Getting back to the movie itself, I personally love the finale. 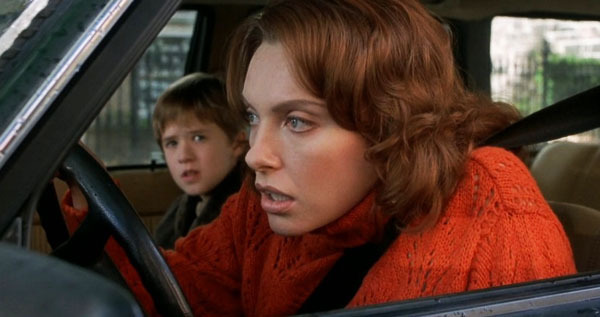 There’s no big climax, no scary action, no show-down with a villain of any sort, it’s just the boy and his mother talking in a car. It’s one of the most impactful and touching scenes I’ve ever experienced in a horror movie of this sort, and could have ended the movie on a very emotional note, but obviously ... that wasn’t the end. I won’t spoil anything specific in this review, but still, let’s talk about the films famous twist ending. Personally, while this was still very effective, it didn’t really take me by surprise either. I was already guising what the film was building up to, but even though I wasn’t surprised by it, this was still a great ending that features a shocking twist done right. I loved all the subtle clues given to us throughout the film. The color red for example was very deliberately and artistically present in key moments to depict certain things that the dead spirits had interacted with while alive. The doctor’s wife for example takes anti depressant pills which are red. The evil mother that poisoned her daughter wore a red dress during the memorial crevice. A red balloon floats up to the top of a stair well where someone died. 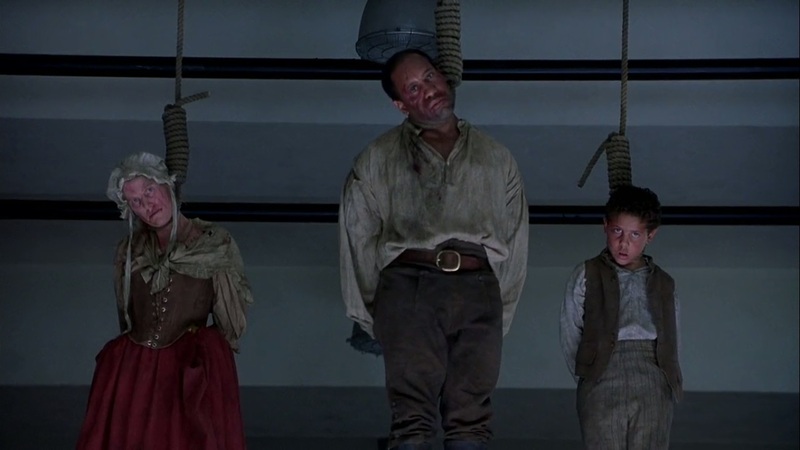 The movie is just beautifully and so artistically shot that way. There’s also a red door knob leading into a basement, which I can’t talk about in detail, but it’s a great little clue. Even without the big twist ending, the movie still works great, and is a very special achievement in horror cinema. It’s a movie that covers issues of pain, remorse, sorrow, regret, loss, things that are very sad, and emotional. It’s more than just an exciting scary movie, it feels deep and meaningful. 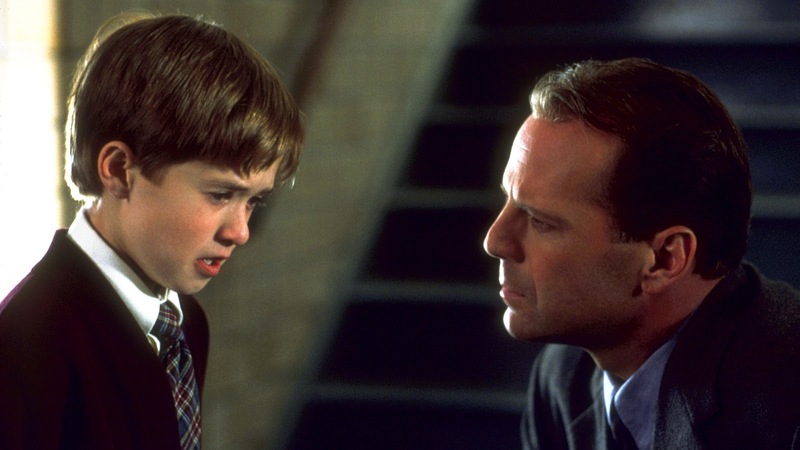 “The Sixth Sense” has all the makings and style of a classic Hollywood picture, yet it’s packed with all the chills and atmosphere of a modern horror movie. It’s such a twisted, original ghost story that’s every bit as haunting as it is poetic. Whenever the movie ends, I’m always left with chills and terry eyes. 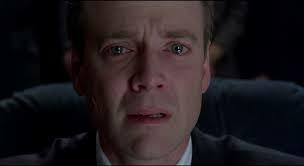 Seriously ... “man tears” ... from a movie about a kid who see’s ghosts ... that’s unbelievable. 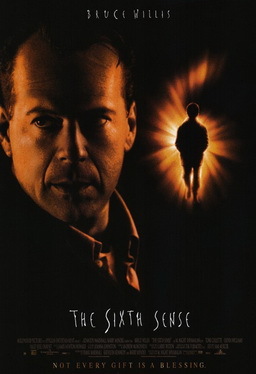 While not my absolute favorite horror movie of all time, nor even my personal favorite of the 90’s, I do still believe that “The Sixth Sense” is the best movie from this age of horror cinema, and far more disserving of the best picture award then “The Silence of the Lambs” ever was. It has a tight screen play, powerful performances, subtle human subtext, and no shortage of real scary material. It’s just an all around perfectly constructed film, and I highly recommend it to anyone weather their horror movie fans or not. I give the “The Sixth Sense” a perfect 5 stars out of 5. Did you know you can create short urls with Shortest and make $$$$ for every visit to your short urls.